By their very nature, many archives tend to represent an ‘institutional’ view of the past, since it’s the history and accountability of organisations (such as the National Health Service) that these archives are set up to represent in the first place. 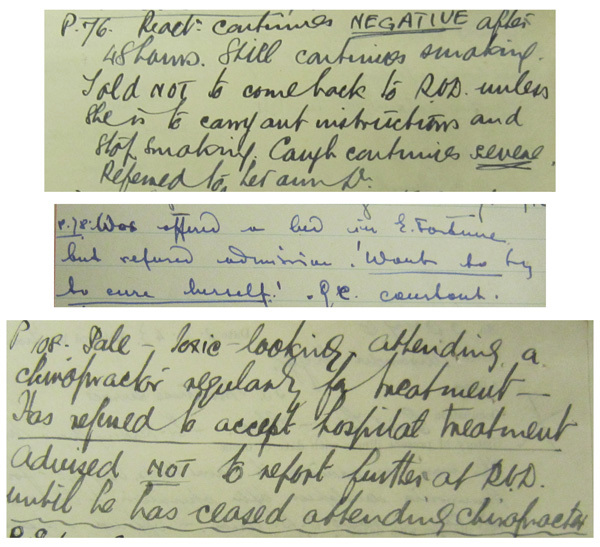 For example, we have many, many records about patients in the form of various registers, ledgers and case histories, but these reflect hospitals’ aims in treating people and sending them out well again – case histories are taken down by a doctor or clerk (not always verbatim), clinical opinions are given on care and progress and the patient’s outcome assessed. First-hand patient experiences, reactions and feelings are almost always filtered through the clinical needs of the record and the voice of the physician – at least in our older holdings. Luckily, we have a number of more modern collections that reset this balance, conveying the direct experiences of those being cared for – one of these being our Cervical Smear and Women’s Health collection (GD31). 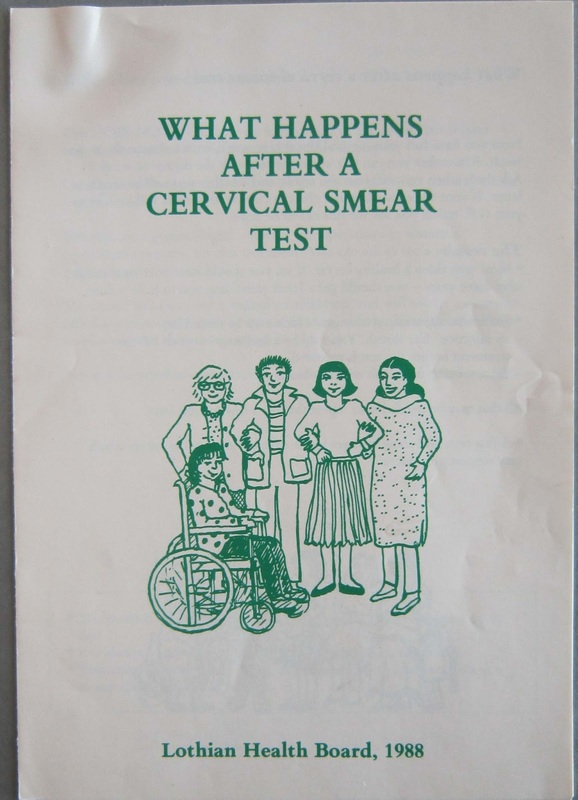 As a result of publicised (and avoidable) deaths from cervical cancer in the early 1980s, Lothian Health Board’s existing cervical screening services were in extremely high demand – particularly since women were not invited to attend regular screenings. In 1985, laboratory facilities had a backlog of 10,000 un-read slides and froze the screening programme to catch up. In response to public concern about this, Edinburgh District Local Health Council and Edinburgh District Council Women’s Committee organised a public meeting, and the ‘Cervical Smear Campaign’ was formed. The campaign petitioned Lothian Health Board to lift all screening restrictions and to demand a fully comprehensive service in Lothian and Scotland, including regular tests with organised call-backs and treatment for abnormal smears. Public support for the petition was massive in Lothian, Fife and the Borders, with nearly 18,000 signatures. 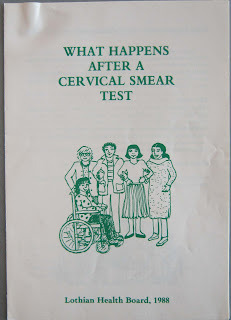 In May 1988, Lothian Health Board introduced three-yearly screening for women aged 20 and over, a computerised recall system, and automatic notification of all test results to women themselves in addition to their doctors. The campaign became national as the decade went on. In November 1987, a second petition was launched, demanding a full screening service across Scotland. Campaign members also gave talks to hundreds of women across the region and produced information leaflets and a video in the absence of any other health education material, raising awareness and changing attitudes towards cervical cancer within the general public, the NHS and the media. Debates around women’s health and morality, still very much on the agenda today, are also reflected in this collected literature. 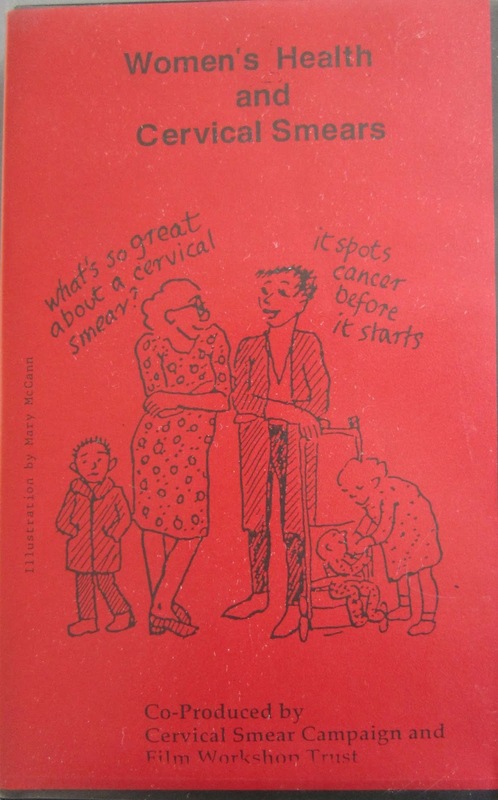 On the back page of a 1985 publication from the London-based Women’s Health Information Centre (GD31/6/1), the moral assumptions involved in abnormal smear results and cervical cancer diagnoses are explored. 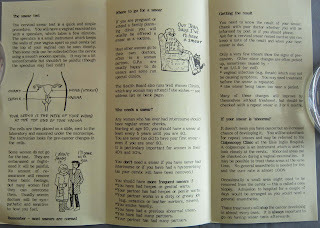 Since the virus that leads to cervical cancer is spread through sexual contact, the article reported women ‘already distressed by a diagnosis of cancer… additionally humiliated by insensitive questions about the number of sexual partners they have had.’ The author describes women being ascribed responsibility for the sexual promiscuity of any potential partners and being urged to keep themselves morally and physically pure to remain cancer-free. 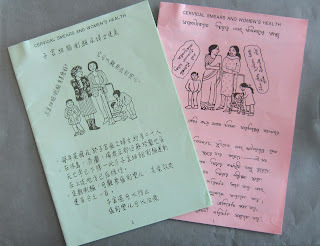 In contrast, despite the increasing incidence in young women in the 1980s, the article points out that cervical cancer ‘remains predominantly a disease of poverty and old age’ – since working class women without a bathroom at home and wives of men working in ‘dusty’ occupations (like mining, working with machine tools and with certain chemicals) were especially vulnerable. Regular testing, social change, health education and better environmental working and living conditions – rather than cementing stigma and fear – were then, as now, seen as the most effective health promotion. 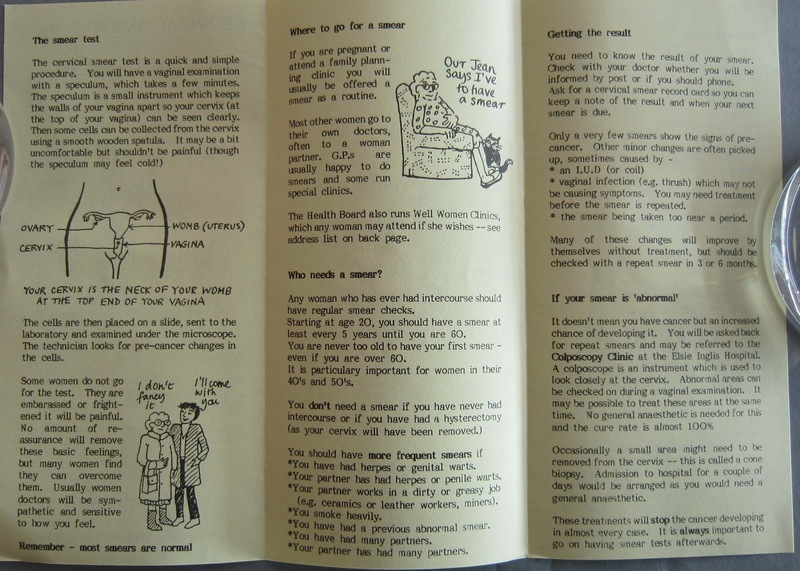 If you’d like to know more about our collections around women’s health in Edinburgh and the Lothians, get in touch. In her final blog post for LHSA, our project cataloguing archivist Rebecca looks back on her time with us and shares some stories from the case notes. Well, I can’t believe it’s been eighteen months since I started work on the RVH v TB project, it’s just flown by! 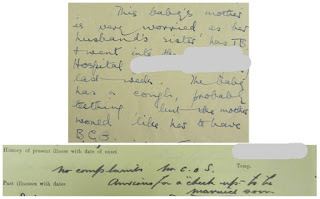 If you’ve been following the blog during that time you’ll see I’ve learnt a lot from cataloguing the case notes about the detection, prevention, and treatment of pulmonary and non-pulmonary tuberculosis, about Robert Philip and the Edinburgh Scheme, and about the city and people of Edinburgh. 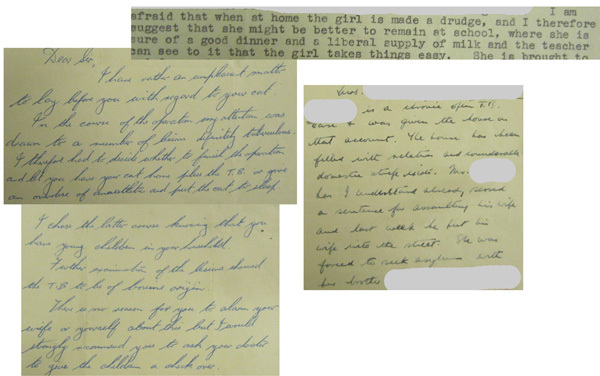 It’s been a great privilege, though not one without challenges, to get such a detailed look at the case notes, as these sorts of records are not usually catalogued individually. 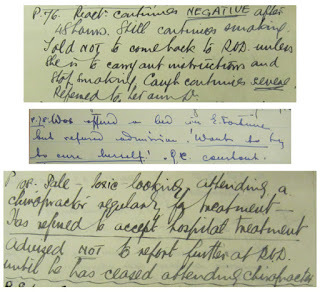 It means that as well as seeing broader trends in TB care, including the development of BCG vaccine and antibiotic treatments, and getting a sense of how the hospitals functioned (in the case of Southfield Sanatorium, apparently not very well! ), I’ve been able to see the stories of individual patients. 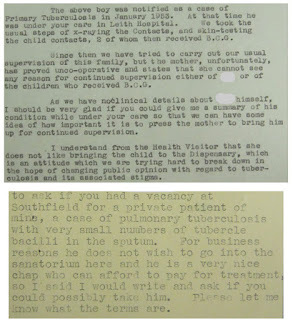 Correspondence from the Southfield Sanatorium series, bemoaning the poor state of the hospital prior to 1946. Some of these stories have been very sad, such as the cat with TB, the child who was kept in school (despite the usual recommendation for bed rest) so as not to be “made a drudge at home”, or the husband who forced his sick wife out of the house she had been allocated to as a result of her illness. Others have been happier, including the many cases of patients making a recovery. 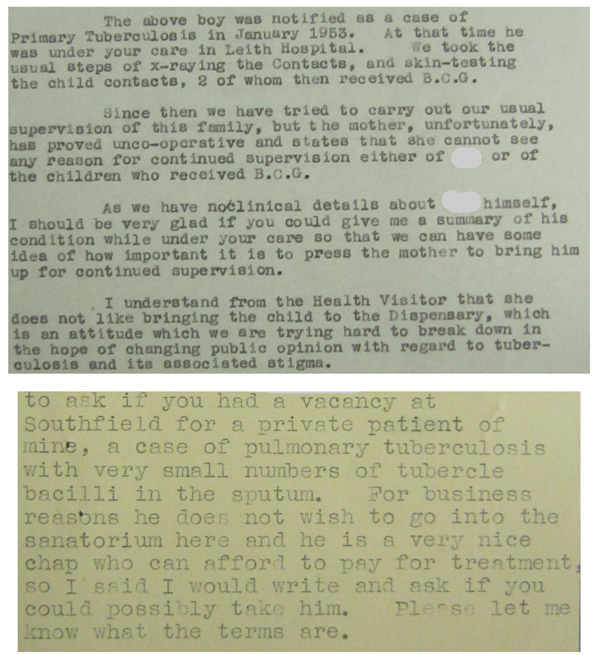 One thing that comes clear is the stigma surrounding tuberculosis, such as the patient from England who went to Southfield in order to avoid it being known in their locality that they had TB. I’ve even seen a patient threatening to sue the hospital for giving them such an outrageous diagnosis! Some records tell us about the eagerness of the patients and their families to get cured of the disease, and the anxiety faced by those who wished to avoid it, while others show signs of refusal to comply with treatment. Over the past eighteen months I’ve been able to see literally thousands of these stories, and they are still throwing up surprises! As well as the catalogue, hopefully another great tool will come out of the work we’ve done on this project, which will reveal the larger stories which the case notes can tell. Last year, I made a successful bid for someone to work on creating a data visualisation tool using data which can be extracted from our case note catalogues. We’ve been tagging and indexing information such as the patient’s gender, age, occupation, medical conditions and treatments throughout the project, and the plan is that this will be put to use to create fancy interactive graphs and charts which can tell the story of the case notes in a visual form. Work on this project hasn’t started yet, but I’m really excited to see what will come out of it! While my work here has mostly been focused on the case notes, I’ve also been lucky enough to learn more about some of the other records and objects held by LHSA. It’s also been a great privilege to take part in other LHSA activities, including assisting Louise at outreach events, attending conferences, delivering a presentation to students on my old course, and even getting crafty and making some ‘zines last month! I’ve really enjoyed working with such a wonderful team over the last 18 months, and I’ll definitely be reading the blog to keep up with what they are getting up to! As is LHSA tradition, we start off the new year’s blogging with a quick look at the exciting things we have on the horizon…and then it’s back to normal service with contributions from the LHSA team talking about the collections and their work with them. This month we’re starting off as we mean to go on by getting involved in a couple of activities that will help make us a better archive – first off by taking part in a workshop to revise the NHS Records Management Code of Practice and secondly, by coming up with a plan of attack to help inform NHS colleagues of the kinds of records we want to take. Both of which will mean that the quality, quantity and regularity of transfers of records to us is improved. Our two Wellcome Trust-funded case note projects will finish this year and we’ll be in a position to launch online catalogues, redacted as appropriate of course! Aline finished cataloguing the Dott case notes a couple of days ago - so we’ve already hit a significant milestone for the project - and Becky and Clair are well on the way to finishing the TB case notes. We’re also looking forward to making more of the records that we hold more accessible, with digital images going onto the University’s online image platform in the not too distant future (http://images.is.ed.ac.uk/) and by continuing the work required to put our catalogues into ArchivesSpace – the University’s online catalogue for archive collections (http://archives.collections.ed.ac.uk/). There are exciting opportunities coming up with the team as we continue to offer internships and volunteer placements, so others will be able to join our Skills for the Future trainee, Samar, in working with us to gain skills and experience in the archive sector. We’re particularly pleased to have secured an Employ.ed internship for the summer which will look at our Levin Collection (to find out more about this important material see Louise’s blog at http://jewishmigrationtoscotland.is.ed.ac.uk/index.php/2016/12/20/the-personal-papers-of-ernst-levin-1887-1975-neurologist-university-of-edinburgh/). 2017 is a big year for the Centre for Research Collections with a major new project to rationalise, preserve and make more accessible the collections in the University Collections Facility, which includes our material held there. So we’re looking forward to getting involved and seeing the benefit to our collections and the people that want to use them. And as well as all that, we'll be providing our usual services - Alice and Louise will be answering your enquiries through 2017...it’s going to be a busy year so watch this space!